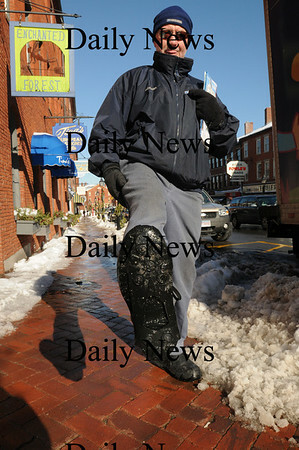 Newburyport: Letter carrier Bill Tremblay uses "stabilizers" on the bottom his boots to walk the icy streets and sidewalks of Newburyport's downtown area. The strap-on device have small cleats attached which help to create traction as golf or football cleats. Photo by Bryan Eaton/ Newburyport Daily News Thursday January 29, 2008.